by Bill Dwight on Friday, July 22, 2011 at 2:10 PM | LEAVE A COMMENT! Last week, I had the pleasure of sitting down with Daphne Munro along with Connie Colla, hosts of the Smart Family show on ABC15 in Phoenix. The topic of our live interview was teaching kids good money management habits which includes one of my favorite habits to jumpstart early: charitable giving. Daphne Munro: Well thanks for joining us live on Smart Family I’m Daphne Munro. Connie Colla: And I am Connie Colla and our goal is always to keep it smart and simple. And you are going to learn something new every day. Daphne Munro: That’s right, like our first smart topic. Does it seem that young people today feel that they are entitled to everything without actually doing anything. Connie Colla: According to the 2007 Gallup Poll, when it comes to inheritance, 44% of young adults 18 to 34 expect their relatives will be giving them money or valuables. Daphne Munro: Yes, and that’s compared to 33% of those a little older at 35 to 54 years old and 10% for those 55 and older. Well, if you want to change your kid’s attitude to a more giving attitude, then you definitely want to listen up. Well joining us now is Bill Dwight who is the creator of FamZoo.com, which is a website that teaches your kids how to manage their money, and he happens to be the father of five kids, so I’m sure he has a lot to say about this topic. So thanks for joining us Bill. Bill Dwight: Thank you for having me. Daphne Munro: So first of all, let’s talk about teaching your kids the idea of giving away their money. Tell me about this. Bill Dwight: Well, typically, they’re focused on spending, but we have a site that encourages kids to both spend and give away their money — and save also. So, that’s a little balance. Daphne Munro: Tell me about your philosophy because you told me your kids, all five of your kids, you encourage them when it comes to — we’ll talk about savings in just a second — but you encourage them to give some of their money that they save. Bill Dwight: Yeah, absolutely. The first thing is for them to have some of their own income so that it’s meaningful when they give it away. It’s easy to give away mom’s money, for example. Daphne Munro: That’s right, of course. Daphne Munro: Okay, so, which leads me to my next question:, how do these kids get money? Bill Dwight: Well that’s a very personal choice because I know for example you are not a big fan of allowance. Daphne Munro: Well actually, I am. My daughter earns her money she gets chores every day. Bill Dwight: In other words some people think allowance is just a tool for teaching finance and that you shouldn’t have to work for it. Daphne Munro: No, no, no. Bill Dwight: Others feel that you should work for chores. Bill Dwight: And so everyone has a different philosophy, and the beauty of FamZoo is we cater to any of those philosophies. But the important thing is that the child views it as their money. Daphne Munro: Okay, so once they are earning their money, and they have their money — now you are saying that you come up with a three-part when it comes to kids managing their money. Bill Dwight: Right, for example my youngest son, Quintin, he does 60% spending, 20% savings, and 20% giving. Bill Dwight: And, over time, when he works up to, say, $50 in his giving account, then we sit down together and say, “well, how would you like to figure out how to donate this money?” And there are lots of wonderful sights online to do that, or you can go into your community. Daphne Munro: Yeah, so how do you get your kids to change their attitude? Bill Dwight: So that’s a teachable moment. That’s an important conversation to have: “why is that good for you, Quintin?” What they find is, when they do it, they feel good. It’s like exercise, you know, it’s a little tough to get started but once you get in the habit, you feel good, it’s good for you, and no one else can exercise for you. That’s why I think it’s important for the kids to have their own money to give away. Bill Dwight: Not only that, if you are taking care of that balance then you are going to have good personal finance skills because you are not spending all of your money. You have some left over for these beneficial things. Daphne Munro: Other things, right. Bill Dwight: To take care of, not only yourself down the road, but also other people and your environment. Daphne Munro: Who could have ever thought that giving of your money would actually teach you how to manage your money well, right? I love that. Bill Dwight: Well, it feels good. Daphne Munro: It does, it does. Okay, now tell me about when it comes to kids and taking them shopping, like it’s a birthday. You’re saying don’t go out and just by other kids a gift. Bill Dwight: Yeah, don’t buy it for them. I think it’s important for the kids to get into the act of giving. So one thing that you can do is you can set up, for example, a gift allowance where you create a budget for gift giving. Bill Dwight: Maybe, you know, how many buddies a year, and a modest gift, and then have your child manage that budget. So, be involved in the purchase of the goods. It makes them feel better to be involved, and it makes them feel a sense of ownership. Bill Dwight: Yeah, that’s the neat thing about the bank of FamZoo, or the bank of Munro in your case, is that you can decide all of these policies because you are the bank manager. Bill Dwight: You might put in matching; you might give her a very aggressive interest rate that you couldn’t get at a real bank. Daphne Munro: I love that. Now, that leads me to the web site that you created. It’s called FamZoo.com. Now what exactly does this web site do from other money management sites? Bill Dwight: Well, what’s neat is that you run your own bank. 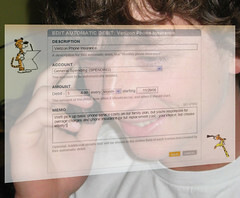 So you can make it match your values and, to the kid, it looks just like an online bank. So they get practice with online banking and personal finance, budgeting, all that stuff. But you’re in charge, you’re in control. You make the rules. Daphne Munro: I love it. Well, you know what, thanks for joining us Bill — some really good advice there on money management skills, and I hope all of your five children turn out to excel when it comes to managing their money. Bill Dwight: Well, thank you, I hope so too. Daphne Munro: And if you would like to check out FamZoo.com, it does cost $30 per year, but you can try it out for two months for free. I have to say it’s rather an interesting site. I hear that Connie is over in our social media station, Connie. Connie Colla: I am, and I bet if Bill plays his cards right, his kids will all be giving him an allowance when he gets older. Daphne Munro: That’s true. I love it. Connie Colla: All right, well, a lot of you are sounding off on our Smart Family 15 Facebook page about entitlement. Does it seem that kids are more entitled these days, or at least feeling it? And what’s the best way to approach that attitude? Well, Chris Hawkins says, I see it all the time teaching high school, it’s showing in the workplace to with young people thinking that they can go straight to the top without having to put in time and effort required for promotion. Parents do have to set limits. And Shanna Peppiatt said, I tell my children they are entitled to these things: a roof over your head, warm meals to fill your tummy so you aren’t hungry, clothes to cover your naked body, and that’s it. Everything else — and I mean everything else — is earned. And Ashley Oakes says, make them earn any spending money that they receive and teach the value of saving up for something rather than just handing it over to them. Well those are great comments and we thank you for them. We always love it when you join the conversation at Facebook.com/smartfamily15. Log in, and join the conversation now. by Bill Dwight on Tuesday, July 19, 2011 at 4:02 PM | LEAVE A COMMENT! Want to hear some of my favorite tips for teaching teens good money habits? Check out my recent guest post over at the Our Kids blog. by Bill Dwight on Thursday, July 07, 2011 at 9:46 AM | LEAVE A COMMENT! Who’s really running your child’s lemonade stand? You or your child? The lemonade stand is one of the classic rituals of summer, and it can be an excellent hands-on way for kids to learn some business basics — if you let them! Unfortunately, many parents inadvertently rob their kids of a golden educational opportunity by handling or hiding some of the basic business mechanics along the way. Instead, take a step back. Let the kids plan and run the business themselves. Let them know you’re available for advice (and seed capital), but otherwise they are in charge. 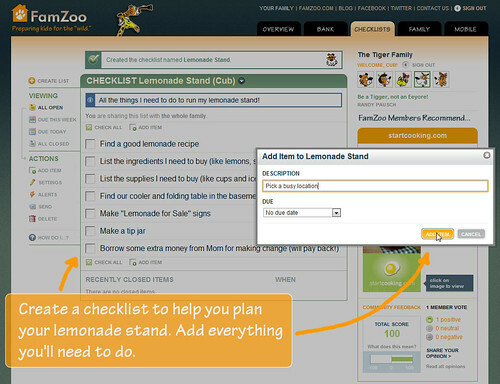 Have your child propose a checklist of all the things she’ll need to do to run her lemonade stand. Review the list together. Forget anything? What will you have to buy and what items do you already have around the house? See the sample checklist in this screenshot for some ideas. 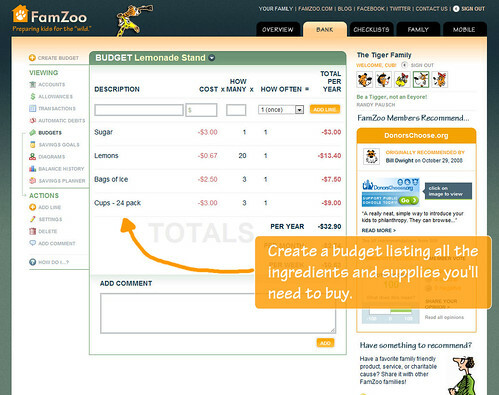 Have your child build a simple budget containing all of the ingredients that he’ll have to buy. How many cups does he think he can sell? How much will all the ingredients and supplies cost? See the sample budget in this screenshot. 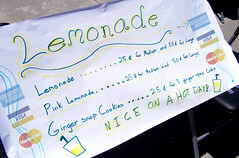 Have your child propose a reasonable price for each cup of lemonade. Will her business turn a profit or suffer a loss? Tune the price and/or the budget until it matches her desired business outcome. Adjust her expectations if necessary. Update your budget to show the bottom line as in this screenshot. OK, your little entrepreneur should be ready to roll. Time to execute. P.S. 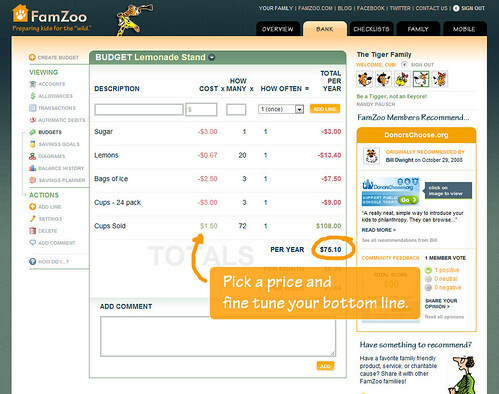 You and your child can use a spread sheet program or even just pencil and paper to do your lemonade stand planning, but if you’d like to try a fun, collaborative online approach, check out FamZoo here.